A museum commemorating the victims of the 2004 Asian tsunami has opened in the Indonesian province of Aceh. 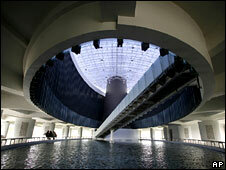 It has been designed as a symbolic reminder of the disaster, as well as an educational centre. It will also serve as an emergency disaster shelter in case the area is ever hit by a tsunami again. Aceh was home to more than half the 240,000 people who died in the disaster. The outpouring of aid which followed was the largest in history. Almost all that aid money has now been spent - gone to pay for more than 130,000 houses and thousands of kilometres of road, as well as bridges, schools, and other infrastructure. But this new museum building, paid for by Aceh's Reconstruction Fund, breaks with the tradition of post-disaster construction. Deeply original and heavy with symbolism, it stands out like a beacon in the provincial capital. It is four storeys high, and built in the shape of a ship; its long curving walls covered in geometric Islamic reliefs. From above, the roof resembles a tidal wave. And the ground floor is modelled on the kind of traditional raised Acehnese houses that were best equipped to survive the tsunami. Inside, visitors enter through a dark, narrow corridor between two high walls of water - meant to recreate the noise and panic of the tsunami itself. It might now be open, but it is still largely empty. The exhibits have not gone in yet. And that has not helped everyone here swallow the cost of it - $6.7m (£4.6m) already. The man behind the original idea for the museum, Eddy Purwanto, admits a project this ambitious - and this expensive - could never have gone ahead while the majority of tsunami victims were still homeless. But now the Reconstruction Agency is about to wrap up its work, he says it is what people wanted. After all the regulation, post-disaster housing, and kilometre after kilometre of road, this is its final, dramatic contribution.